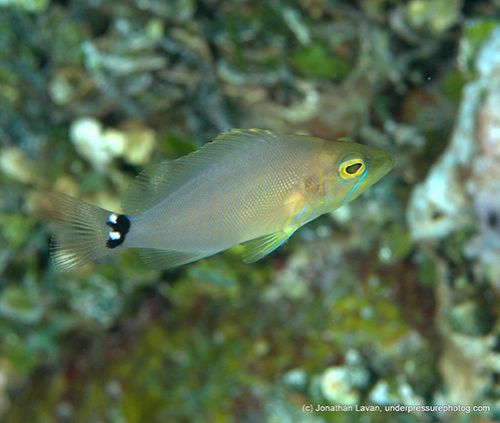 Hamlets in the genus Hypoplectrus are unique among sea bass for two reasons. First of all, they only live in the Caribbean and therefore are a perfect subject for this column. Secondly, there is a long-standing debate as to whether or not there is more than one species. At present, they are officially listed as different species and we will treat them as such, but will examine some unique qualities and habits that may suggest otherwise. Small in stature (averaging 5 inches) but mighty in attitude, hamlets are easy to photograph because they usually will stand their ground. 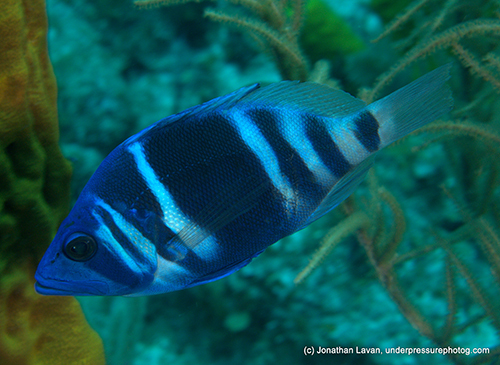 One reason, it is theorized, for their different colors and pattern is that they are mimicking whatever Damselfish or Chromis species is most numerous in the area. 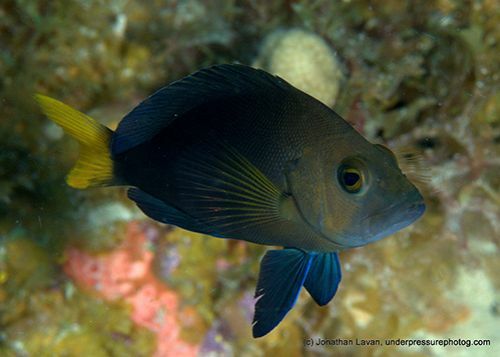 Damselfish are well known herbivores, always tending and defending their little algae gardens. So if a similar sized, shaped and colored predator can take advantage of being mistaken for an herbivore, you know they will. 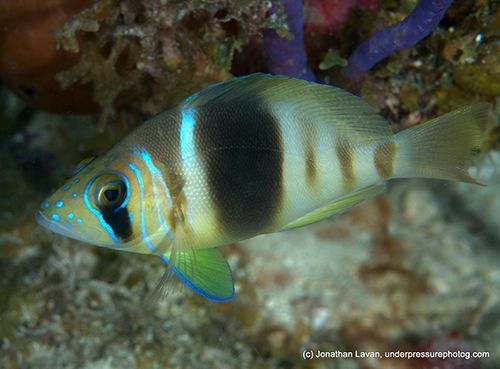 The best examples of this are the Yellowtail Hamlet mimicking the Yellowtail Damselfish and the Black Hamlet mimicking the Longfin and/or Dusky Damselfish. Hamlets have unusual mating habits as well. They mate everyday at dusk rising up in the water column cupping around each other to spawn. What makes this ritual truly unique is that all Hamlets are simultaneous hermaphrodites. 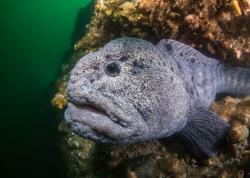 What this means, quite simply, is that the fish are both male and female and will trade places, back and forth, during the course of each mating rise. In fact, it has been observed that if one fish in the pair feels as if he/she has not gotten their fair share of male or female time, they will chase their mate around the reef in dissatisfaction. And you thought you had it tough in your relationship. Usually Hamlets of the same species will seek each other out and live in close proximity to each other for easy access. However, if that same species is not available a Hamlet will often mate with the species that is available. This leads to a hybridized Hamlet. 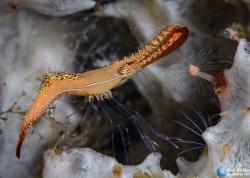 When observing offspring it might or might not be easy to pick out which two species have mixed. Typically it is scientifically accepted that any two animals that can successfully breed with each other and have viable offspring that can also breed are the same species. Hamlets’ mating behavior is a clear example suggesting that they all may in fact be the same species. Another reason to speculate that they are the same species is that all juvenile Hamlets or “fry” look exactly the same and then will morph into one species or another (see photo). As I had mentioned, they are a great starter fish for the beginning underwater photographer. They are dynamic, colorful and will suffer close approach most of the time, usually giving some nice profile and full front views. 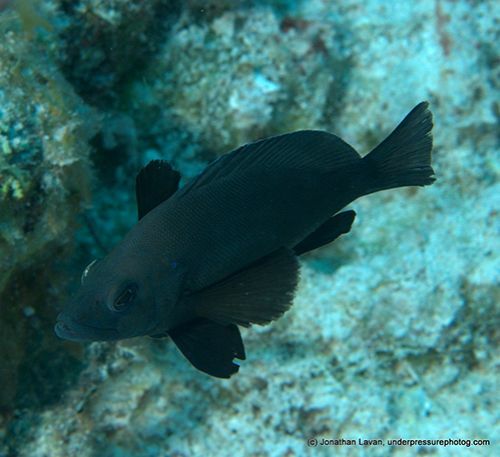 When you are diving, always move slowly, as it is easy to swim past these small fish. 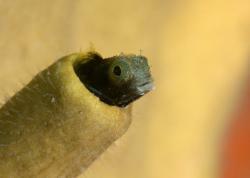 They frequently can be tucked into a crevice or observing you from behind a gorgonian. 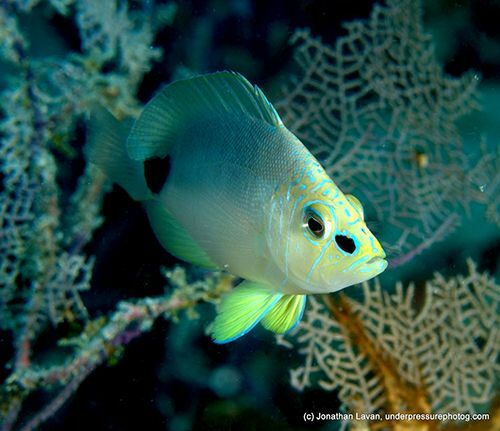 They are there watching you, watch for them on a Caribbean Coral Reef.